Since my oldest child started college this past fall, it’s been hard not to compare everything at her school to what I had when I was in college. I do my best not to sound like, “When I was in college, we had to use quarters in the washing machines and we had to wait for our laundry to be finished. No text alerts back then!” Although now that I think about it, I met my future husband in the laundry room while we were both waiting for our laundry to finish! Ha! Of course, I am so food-centric, I pay close attention to dining hall options and food choices in the area around my daughter’s campus. And let me tell me you, back when I was in college, there was no juice and smoothie bar in the dining hall for breakfast. There was, however, an all-you-can-eat supply of Quaker granola, sugar cereals and hydrogenated peanut butter! It’s no wonder I gained about 20 pounds in college. My roommate freshman year blew my mind with this instant noodle soup concoction that she made in our room every day. I could not believe, especially coming from an Italian home where we ate fresh pasta multiple times each week, how she could just pour hot water into a cup and it would turn into a tasty noodle soup. She called it ramen noodle soup, to be exact. Many years later I discovered that this instant meal was probably one of the worst things anyone could eat. (I really should check up on this girl to make sure she’s still ok!) Between the myriad of MSG and MSG-derivatives, the seasonings in the mixture also contain preservatives, chemicals, food coloring and other inexplicables. To make things worse, I just found out recently that instant ramen noodles are deep fried and dehydrated. Deep fried foods are also among the worst things you can eat. Therefore, you don’t need to be a rocket scientist to deduce that instant ramen noodle soup is a DISASTER. 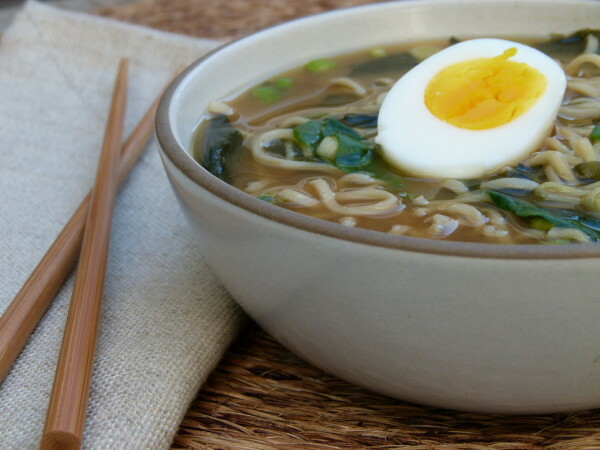 So, since I have a lot of college kids following my blog and Instagram now, I thought I should share my version of a quick ramen noodle soup recipe. 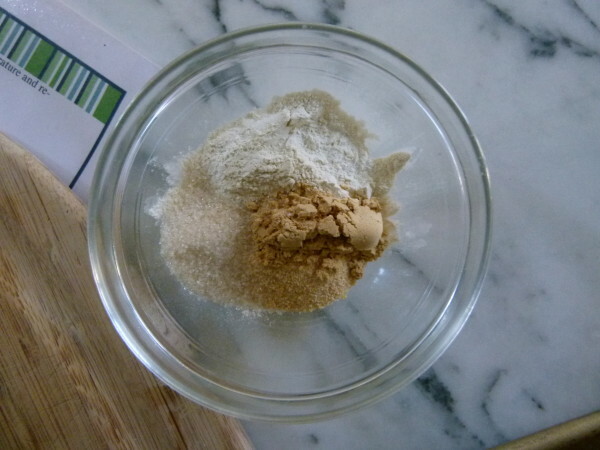 I looked at some seasoning packets from “healthier” soup packets and saw a few ingredients that showed up regularly — onion powder, garlic powder, miso powder, shoyu powder, and ground ginger. I could do that! So I played around with a few proportions and came up with the recipe here. I also did a little research into authentic ramen noodle soups (like the kind that use fresh, homemade noodles), and learned that most of the broths are pork, veggie or a seaweed and bonito (fish)-base. But I think if you want to use chicken stock, you should! When I taught the soup in my classes, I used homemade vegetable stock. I found a great ramen noodle called Koyo that is baked, not fried. But feel free to use any noodle you want. Lotus Foods makes a gluten-free noodle which is good. I also kept it simple with toppings, but really the sky’s the limit. You can add cooked chicken, pork or shrimp. I love adding a halved hard or soft boiled eggs. Veggies that are great include bean sprouts, spinach, green onions, shredded carrots, bok choy or whatever you have on hand recently. You can really make this into a meal! I think what many of my students found appealing though, was how fast this came together and that it is quite kid-friendly. I know so many of you are struggling with rather cold temperatures and I think this would be the perfect thing to whip up for lunch or dinner to warm up! Place the vegetable stock in a large pot and bring to a boil. 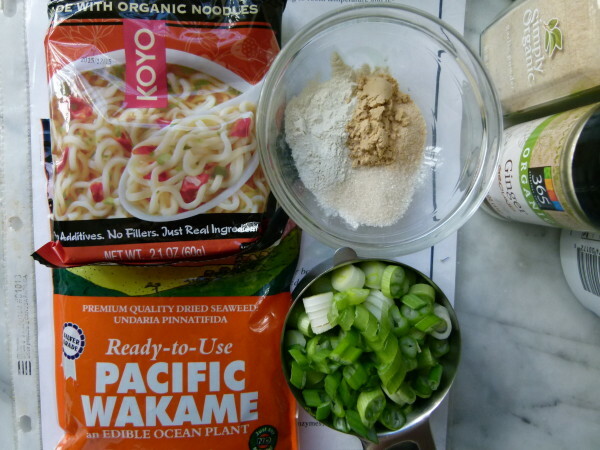 Add the noodles, shoyu, sugar, onion powder, garlic powder, ground ginger, and wakame flakes and cook for 3-4 minutes or until the ramen noodles are soft. 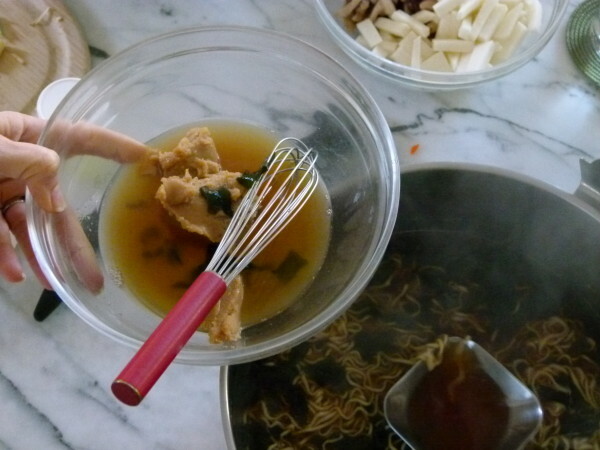 Pour a ladle-full of stock into a bowl and add the miso*, whisk until smooth and then pour back into the stockpot. Stir in a few handfuls of baby spinach leaves until wilted. Ladle into bowls and garnish with scallions. Serve as is or with additional accompaniments as suggested above. Feel free to adjust measurements based on your taste. 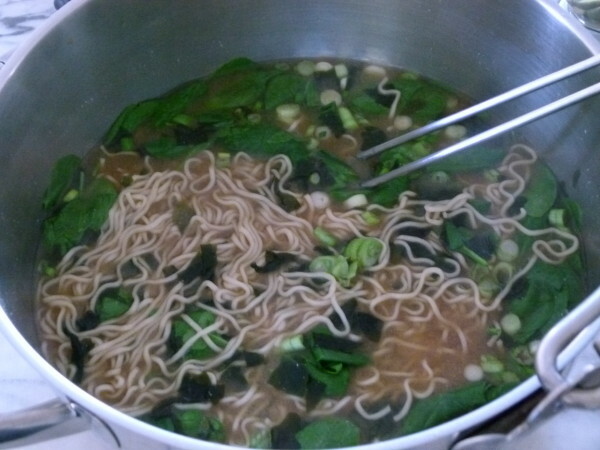 I originally taught the soup with more seaweed because I really like it, but I don't think everyone liked it as much as I do, so I reduced the amount. Of course you can leave it out altogether if you wish! Also, some noodles are starchier than others, which means they will thicken up the soup a bit. If you want to avoid that, cook the noodles separately and dived them up between the bowls and pour the soup on top. Miso is a live food. In order to preserve its beneficial enzymes, do not boil it. *Try to buy a brand where the noodles are baked, not fried, like Koyo or Ka-me. If you use gluten-free noodles, boil them in a separate pot since they’ll make the soup too starchy. Oy! 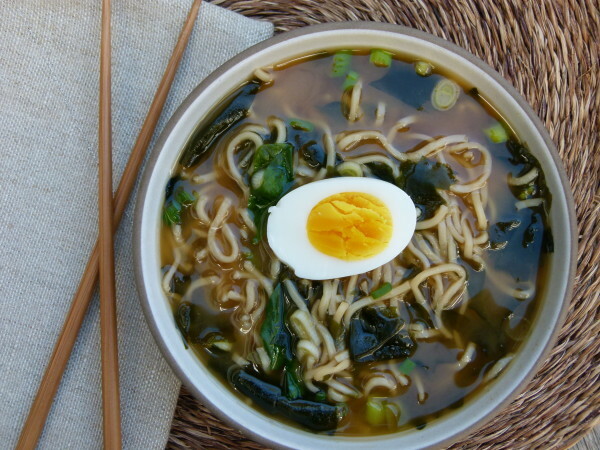 I cannot find Koyo Organic Ramen Noodles to make your ramen soup recipe! Whole Foods only had the pre-seasoned 1.6 ouncers and both Amazon and Koyo websites state that the Organic Ramen Noodles are unavailable. Do you think I should check out my local Asian market? I cannot be sure they would have something non-fried… I saw that the GF Lotus noodles were also suggested, yet my DD is really wanting a replica of the [dreaded] Cup O’ Noodles that her peers are eating in middle school. Any suggestions would be so very appreciated! Darn! The preseasoned ones — do they have a packet of seasoning in the package that you can throw away or are the seasonings mixed into the noodles? They expand when you cook them! MY KIDS LOVED THIS RECIPE!!!! And it was SO easy!! !…but now I am sort of freaking out. The dried Pacific wakame package stated to soak for 5 minutes and to then use…which I did NOT do…and ALSO had a CA Prop 65 warning sticker attached to the back of the beg! Shame on me for not buying organic??? It was the ONLY bag of dried wakame at Whole Foods. Any thoughts on this?? Just curious what you think! It has nothing to do with organic. IN fact, I don’t think organic seaweed exists. Some seaweeds have high levels or arsenic, one company was being sued for lead, I’m sure some seaweed off the coast of Japan has been found with radioactive particles. Just skip it. Yum — two things I would add here as well. SO cool that your 14-year-old eats this for breakfast. You’re doing something right! Looks delicious! Can you tell me how you made that perfect looking hard boiled egg? Never mind I found your video! Looks super easy and yummy. I’m thinking of doing a college care package and sending all the dry and non refrigerated ingredients with recipe. Just not sure she can get the miso. That’s a great idea! If you’re shipping to a cold location, Why don’t you send the miso in the package, too?